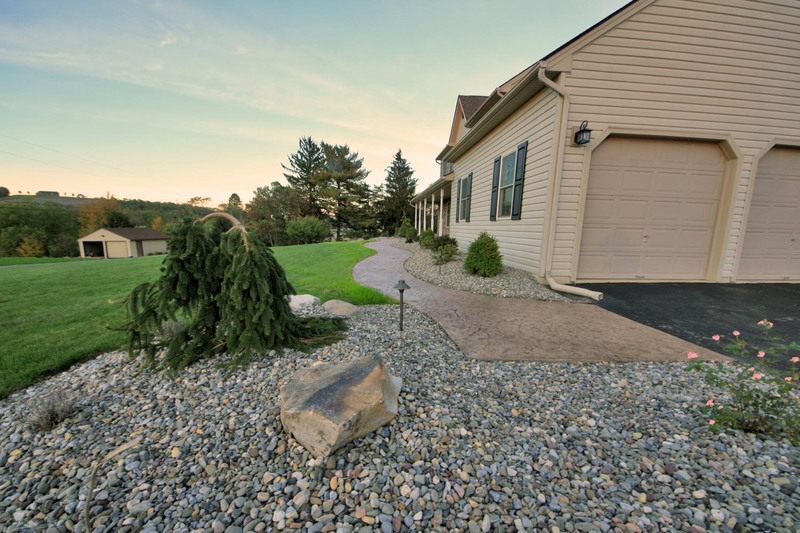 Our client’s property is rather large and it is sloped in many different ways. The first floor of the house sits at the highest point with the terrain sloping in each direction away from the house. There is a deck that comes off of the first floor back door. Below the first floor is a finished basement that has an access to the outside. This access area leads to the lowest point on the property and is surrounded by a large L-shaped retaining wall on two of the three sides. 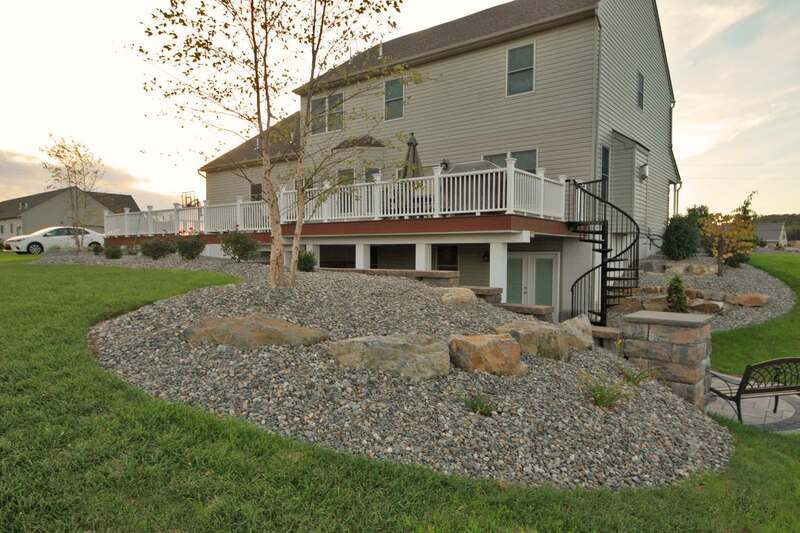 This area is covered partially by a deck that sits off of the main level off the house. 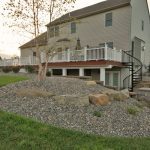 Our clients needed a large space to utilize the area outside of his finished basement. 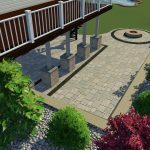 Under the deck will include a water proof under deck ceiling system that will allow for our client to use this space through inclement weather. They plan to leave the dining and cooking area in the open. Under the deck would be a relaxing area that would include a couch and hammock. The area needed to be accessible from all points of the yard because there would eventually be a pool constructed. Currently the only set of steps is at the far end of the deck. 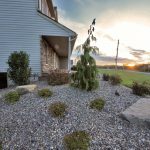 In between all the new elements and the house our client wanted a low maintenance planting plan that would include decorative stone for all the beds. 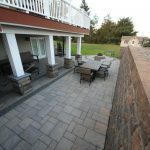 The new paver patio we designed and installed is approximately 1000 square feet and contains decorative paver bands that encompass the fire pit and the pillars. 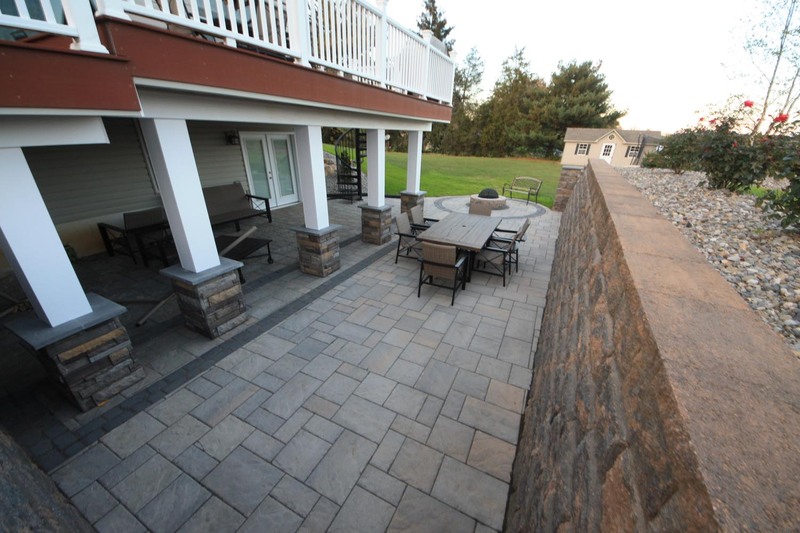 The main paver stone is Techo Bloc Blu 60 in a Champlain Gray. 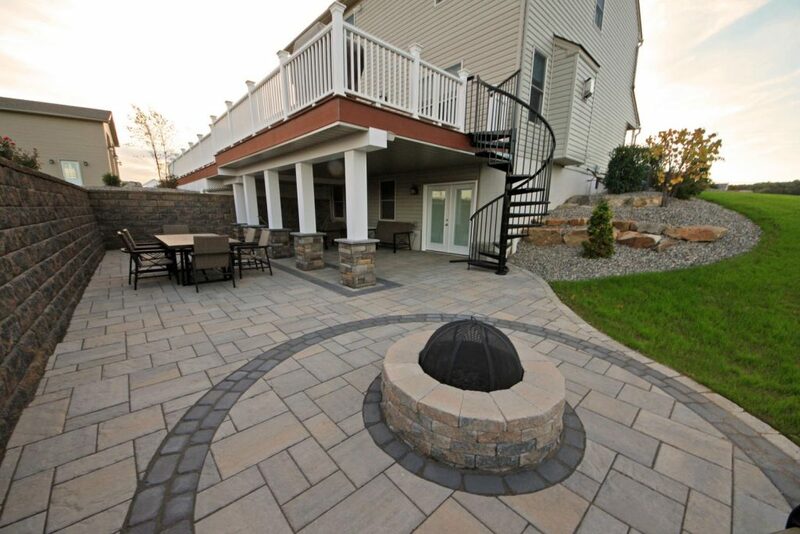 The decorative bands used are made of Techo Bloc Villagio in an Onyx Black. 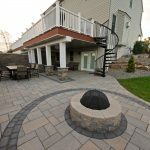 The fire pit is a wood burning Techo Bloc Valencia Fire Pit that includes a steel pan with a cover, which had to be purchased separately. The patio makes two curves at the open end. The larger curve has the fire pit installed. 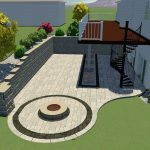 The smaller curve was created to allow room for a spiral staircase that would connect the deck to the patio below. 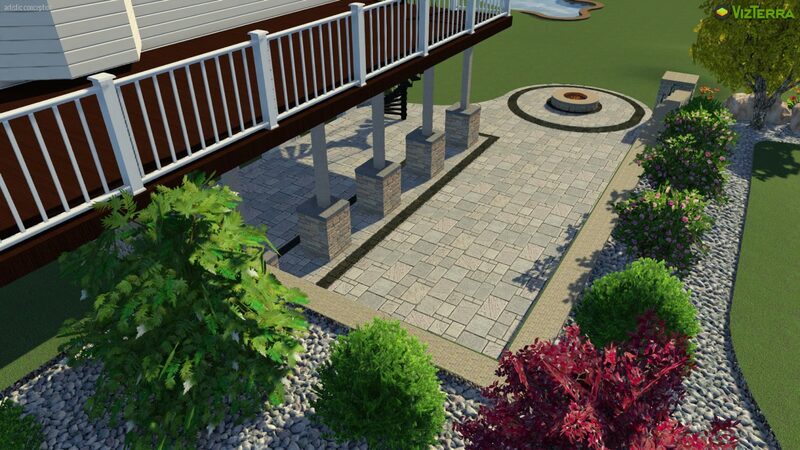 For the second phase of the project we planned a design that includes a new stamped concrete walkway and front porch. 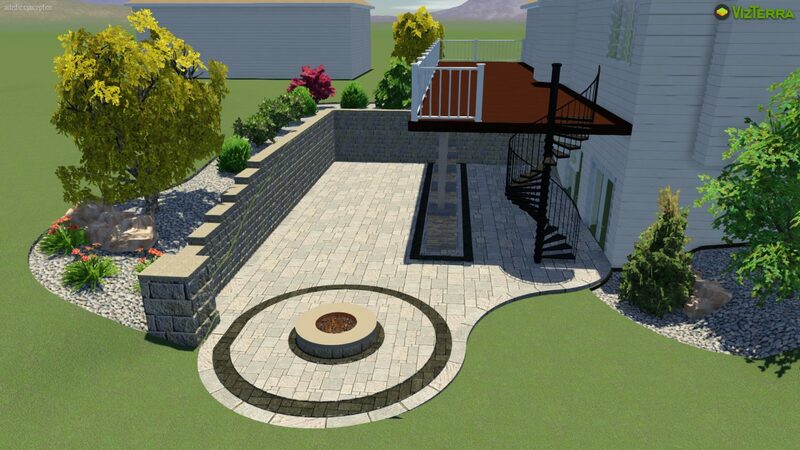 We also planned out a planting bed and landscape lighting design for the entire perimeter of the house. 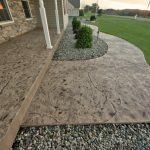 We removed an existing front walkway and post lights and designed a decorative stamped concrete walkway with seamless, textured stamp in a beige crème and walnut color combination. 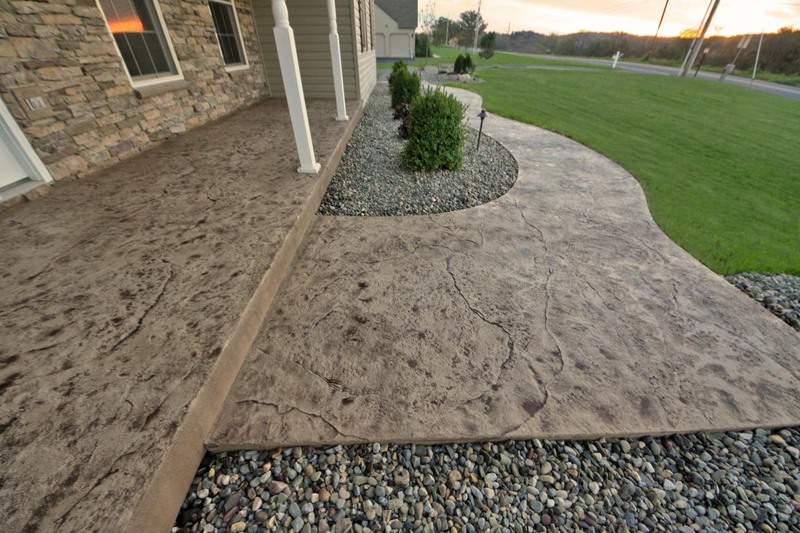 The walkway leads to a large front porch which was capped with the same style and color. Around the serpentine walkway we included planting beds. 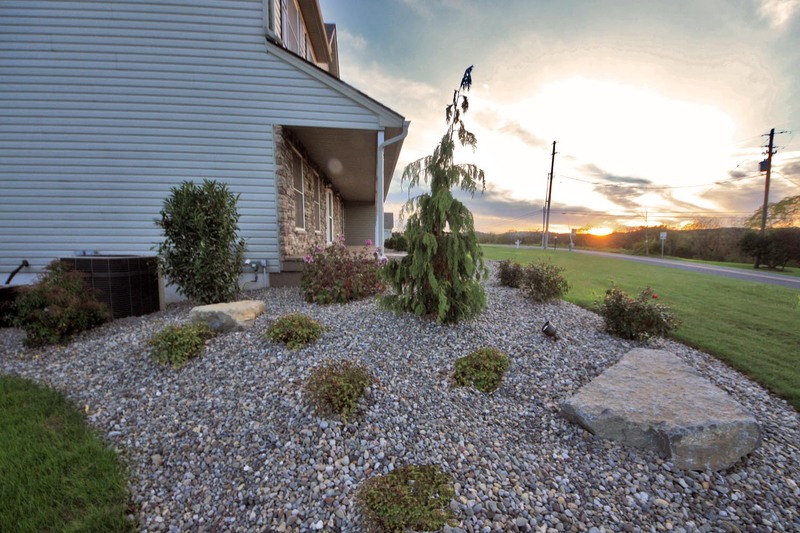 The planting beds extend down the sides of the house and around the back. We framed the house with an Alaskan Cedar and Dogwood. There is an existing Cherry Tree on the side of the Cedar, so our plan was to balance the spring colors. 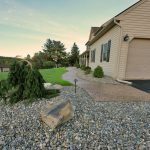 Our client chose to use a decorative stone with no mulch. 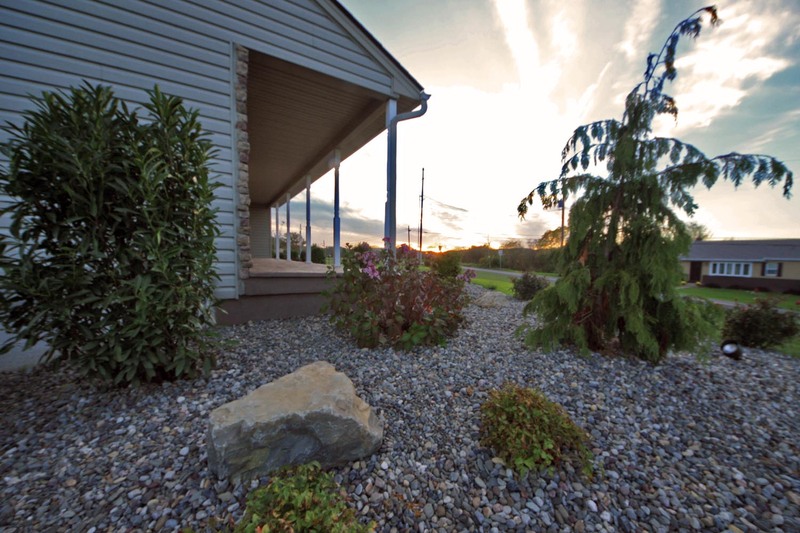 The decorative stone we used is a ¾” Delaware River Stone throughout the entire property. For the backyard we framed the house using Birch Trees. 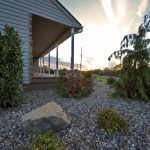 In between the trees in both the front and the back of the house is a combination of flowering shrubs, evergreen shrubs, and perennials that cover all the seasons with color and seasonal interest for both sunny and shady area around the house. We added boulders where there is dramatic terrain change on the eastern side and in the back. Adding boulders sporadically throughout the planting beds ensures we keep balance of material.